Simply Sofas are happy to present the fantastic Dylan Byron Corner Sofa Black & Charcoal Right or Left with Matching Footstool. With so many on offer today, it is good to have a name you can trust. The Dylan Byron Corner Sofa Black & Charcoal Right or Left with Matching Footstool is certainly that and will be a superb buy. 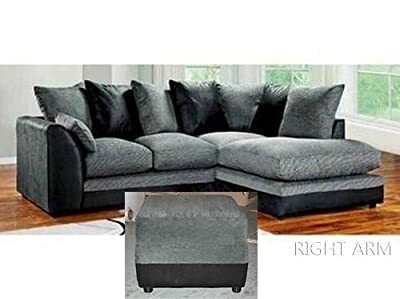 For this great price, the Dylan Byron Corner Sofa Black & Charcoal Right or Left with Matching Footstool comes highly recommended and is a regular choice with many people. Abakus Direct have included some excellent touches and this means great value. Whether you're looking for a corner group or a sofa, the Dylan variety uses an unequalled combination of style and worth. A mix of soft structured cable chenille and trendy faux leather fabric together with deep filled fiber seats and backs make the Dylan as comfy as it is stylish. This corner couch is readily available as a left and right hand. A relaxed look and a comfortable feel Combination of soft structured chenille and fashionable faux leather fabric together with deep filled fibre seats and backs make the Dylan as comfortable as it is stylish. Overall size of the sofa (W)212, (D)164, (H)78cm, footstool (W)60, (D)50, (H)42cm. We don't deliver to N.Ireland, Scottish Highlands and Islands.